Rab GTPases now comprise a family of >63 members. They are emerging as the key hub element controlling the membrane architecture of eukaryotic cells. They are intimately involved in vesicle targeting and fusion in both the endocytic and exocytic pathways and direct the assembly and disassembly of protein complexes that include regulators (GEFs and GAPs), effectors (tethers/motors) and fusion components (SNAREs) that control membrane targeting and fusion. During the last 3 years the field has virtually exploded with the identification and characterization of many new Rab proteins and their effectors. Our understanding of how Rab GTPases control membrane function remains at its infancy. 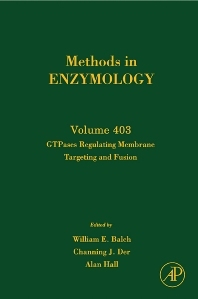 This volume of Methods in Enzymology, GTPases Regulating Membrane Targeting and Fusion, provides a wealth of new concepts, approaches and tools to study Rab proteins in the test tube and in living cells that will be of strong benefit to both established laboratories and new investigators in the field to elucidate Rab GTPase function in cellular development, differentiation and proliferation. Biochemists, biophysicists, cell biologists, molecular biologists, geneticists, developmental biologists.